AshleyNewell.me: It's Hip Hop Day! Come hang out with me and the other Unity addicts in the Unity forum today! It's Hip Hop day so that means lots of games, challenges, prizes, 4 new releases, and chatting with the best group of ladies around! Woohoo! Here's a card I made for the Clean and Simple challenge this week. 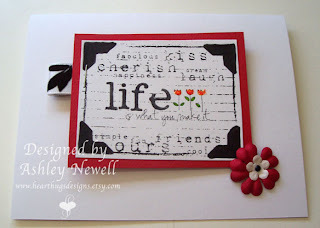 The challenge was to use tiny pieces of ribbon on your card. I used just a tiny piece to make my ribbon tab. The stamp is Unity's Create Your Life. I colored the flowers, added Stickles to them, and finished with Primas and a brad. Super simple!